Several agencies are launching investigations after an April 28 fight between officers and a patient was caught on camera. The Department of Children and Families, the Agency for Healthcare Administration and the Broward Sheriff's Office are launching an investigation into allegations about the use of physical and chemical restraints at a Pembroke Pines psychiatric facility. 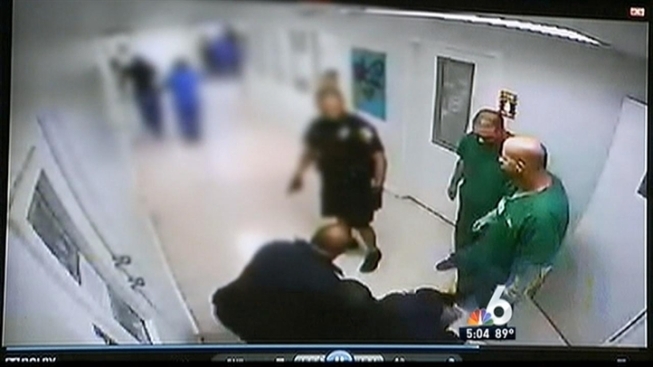 It started with an April 28 incident captured on-camera inside Citrus Center for Adolescent Treatment involving a 14-year-old patient who is a ward of the state and a Pembroke Pines police officer. On the video, a female staff member can be seen poking the patient in the back as she's walking. When an officer grabs the patient's arm, she throws a punch. The officer then punches the patient straight in the face as two other officers look on. While the patient is going to the ground, another officer steps in and sprays mace in her face, said Gordon Weekes, the public defender representing the patient. "To have law enforcement hit them and abuse them like this is unacceptable," Weekes said. Weekes sent a letter of complaint to DCF, who has a contract with Citrus, an inpatient facility for high-risk teens with serious mental health issues. Unprecedented and alarming. That's how child advocates describe the recent cluster of deaths allegedly due to abuse and neglect. Florida's Children First President Howard Talenfeld and Interim DCF Secretary Esther Jacobo discussed the issue. When Weekes came to Citrus to talk to the patient and others he learned of the disturbing practices detailed in the letter. "Minor girls are routinely tied face-down to a bed for minor infractions, without the staff first employing less restrictive alternatives," he said in the letter. "Even more disturbing than the excessive use of physical restraint is the use of chemical sedatives." He also said he heard about an inappropriate relationship between a patient and a Citrus employee. "The male staffer was described to be 'dating' a youth receiving treatment at the facility," Meek wrote. "I was advised that female youth are also housed in living facilities occupied by male patients of the program, and that they share restrooms." Josephine Van Hemert, an attorney for Citrus Health, told NBC 6 there will be an internal investigation to look into the matter. She said the allegations are being taken seriously and that some of the patients tend to fabricate and sensationalize situations. "Our main concern is always to provide our clients with a high level of service, while also ensuring their safety and well-being," she said in a written statement. Pembroke Pines Police will also be conducting an internal investigation into the officer who was seen punching the patient, officials said. Police Captain Al Xiques said officers had responded to a situation described as a riot, where the inmates were fighting each other and beating up staff. Additional assistance was needed from Miramar Police, he said. "The tape looks worse than what it is," Xiques said.